Poppies growing in a field. 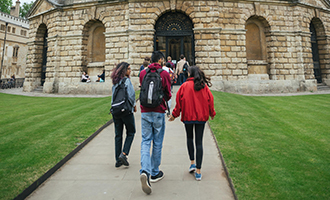 Oxford’s History course combines the examination of large regions over extended periods of time with more focused work on smaller social groups, shorter periods and particular themes. It provides a distinctive education by developing an awareness of the differing political, cultural, social and economic structures within past societies and how they interrelate. The course combines vigorous debate over questions of interpretation with rigorous attention to source material, while the constant enrichment by cross-fertilisation from other disciplines leads to new questions about the past. 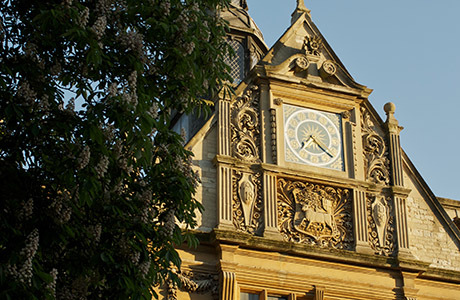 Oxford is celebrated for the broad chronological sweep of its courses and the enormous amount of choice offered. Students can study options on any part of British and European history from the declining years of the Roman Empire to the present day. The geographical range is also broad: there are options on North American, Latin American, Asian and African history (see the department website for further details). 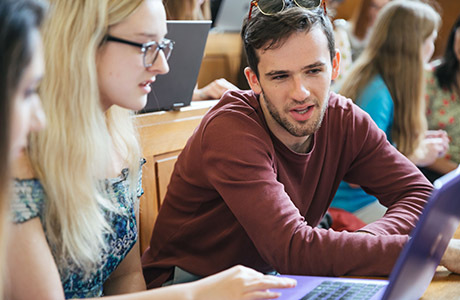 Students are encouraged to adopt a variety of interdisciplinary approaches to their work, and the faculty is strong on intellectual and cultural history options. The Oxford History Faculty is at the forefront of research. Oxford also possesses exceptional library provision for History in the Bodleian Library, the History Faculty Library, the Sackler and the Weston Library’s special collections. During the first year, you will be expected to attend around five lectures each week, participate in regular meetings with tutors to discuss work, conduct independent research and write at least one essay a week. In the second and third years you will have the opportunity to choose from an enormous variety of lectures, and your regular tutorials will be supplemented by faculty classes where you will discuss work with a larger number of students. The third-year thesis will give you the opportunity to engage in a piece of independent research. Generally students are very much in charge of their own timetable throughout their course. Tutorials are usually 2-4 students and a tutor. Class sizes may vary depending on the options you choose. There would usually be no more than around 12 students although the more popular classes may include up to 30 students. Most tutorials, classes, and lectures are delivered by staff who are tutors in their subject. Many are world-leading experts with years of experience in teaching and research. Some teaching may also be delivered by postgraduate students who are usually studying at doctorate level. For the latest information on all course details and options see the History website. Recommended: It is highly recommended for candidates to have History to A-level, Advanced Higher, Higher Level in the IB or another equivalent. All candidates must take the History Aptitude Test (HAT) as part of their application. Separate registration for each test is required and it is the responsibility of the candidate to ensure that they are registered for these tests. We strongly recommend making the arrangements in plenty of time before the deadline. For everything you need to know, including guidance on how to prepare, see the HAT page. Changes to HAT for 2019 entry: The HAT will consist of one question based on an extract from a primary source, to be answered in one hour. The format of this question will be similar to question 3 of past papers which are available on the HAT page. Description: All candidates are required to send in an essay on an historical topic of A-level, or equivalent, written in their own time as part of their normal school or college work. If these requirements cause any problems, please contact the Tutor for Admissions at your college of preference. Note that in selecting work for submission you should choose a piece which has enthused you and on which you are willing to talk. Do not worry if you have changed your mind on the topic since writing it. Tutors are impressed by candidates who remain intellectually engaged with their work. Tutors are looking for intellectual curiosity as well as a flexible approach to engaging with unfamiliar concepts or arguments and an enthusiasm for history. If you are shortlisted, you may be asked to discuss your submitted written work and personal statement during interview. Candidates may also be asked to read and talk about a short passage as part of the interview. For more detail on the selection criteria for this course, please see the History website. History graduates go on to follow diverse careers in fields such as the law, investment banking and consultancies, advertising, accountancy, the Civil Service, publishing, journalism and the media, global charity work, museums, librarianship and archive work, and teaching. For the largest volume of world-leading research in the most recent (2014) Research Excellence Framework. Why not have a look at some History magazines such as History Today or BBC History (which also has weekly podcasts). You may also like to explore the British Museum website or BBC Radio 4 archives, both of which have excellent links to historical materials.